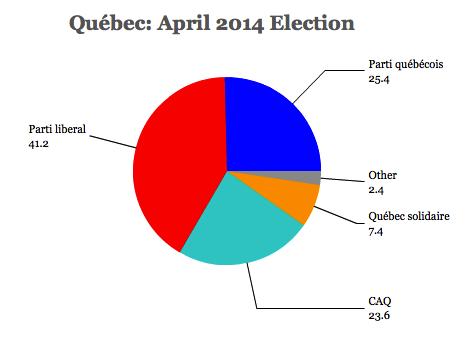 What were Québec’s voters looking for in its provincial election? Obviously not the hard-core separatist agenda that premier Pauline Marois did such a poor job of concealing from voters. As soon as a potential referendum on independence became the central issue of the election, Marois’s Parti québécois (PQ) immediately lost its polling lead. Obviously not the market-friendly approach to government that François Legault champions. 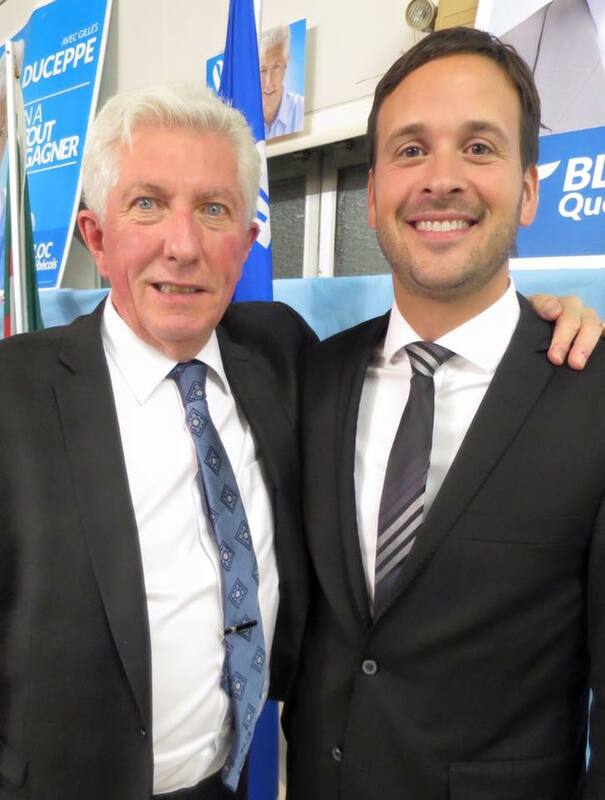 He’s now failed twice to convince Québec’s voters to elect the Coalition avenir Québec (CAQ) into government. 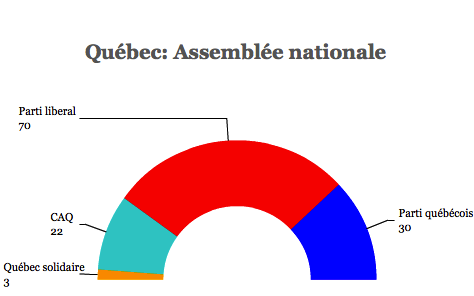 Despite its massive win in today’s election, it’s not obvious that the Québec electorate was so incredibly excited about returning the Parti libéral du Québec (Liberal Party, or PLQ) to power just 18 months in opposition. The Charbonneau Commission, appointed during the previous Liberal government of premier Jean Charest, hasn’t even finished its inquiry into allegations of corruption related to the awarding of (mostly Liberal) government contracts. Imagine, instead, if Québec voters had a fourth option — a party with the social democratic credibility that the CAQ lacks but without the PQ’s separatist agenda and without the baggage of last decade’s Liberal governments? That’s right — a province-level party of the New Democratic Party, or the Nouveau Parti démocratique du Québec (NPDQ). The sovereigntist Parti québécois (PQ) has lost power after just 18 months leading a minority government. Instead, former health minister Philippe Couillard, barely a year after winning the leadership of the federalist Parti libéral du Québec (Liberal Party, or PLQ), will lead a majority government as Québec’s new premier. 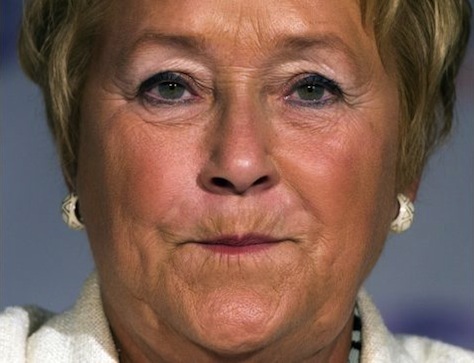 Incredibly, in the riding of Charlevoix–Côte-de-Beaupré, premier Pauline Marois has lost her race against Liberal Caroline Simard, and in an address to supporters, announced she would step down as PQ leader as well. When she called a snap election in March, Marois had every reason to believe that she would sail through the election and win a majority government for the PQ. Conservative Canadian prime minister Stephen Harper was so worried about the prospect of a separatist majority in Québec that he reached out to the leaders of the other major parties, including Liberal Party leader Justin Trudeau and New Democratic Party leader Thomas Mulcair for advice. 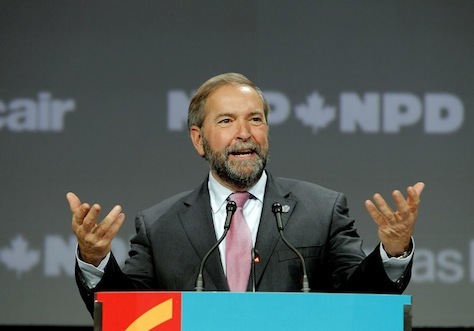 Though Trudeau and the federal Liberals endorsed Couillard and the PLQ, the Tories and the NDP have remained neutral. The last time the PQ won such a small share of the vote in a provincial election was in 1970, when it won just 23.06%, when it was running in its first election after its foundation in 1968. The PQ has suffered what might be an even more humiliating defeat than its 2007 showing, when the PQ placed third, behind both the Liberals and the predecessor to the CAQ, the Action démocratique du Québec (ADQ) — it won just 36 seats and 28.5% of the vote. In L’Assomption, François Legault, the leader of the center-right Coalition avenir Québec (CAQ) won his race against the PQ’s Pierre Paquette, a former federal MP from the sovereigntist Bloc québécois. Couillard easily won a race in his riding of Roberval, which was supposed to be a difficult race against the PQ’s Denis Trottier, an incumbent since 2007. 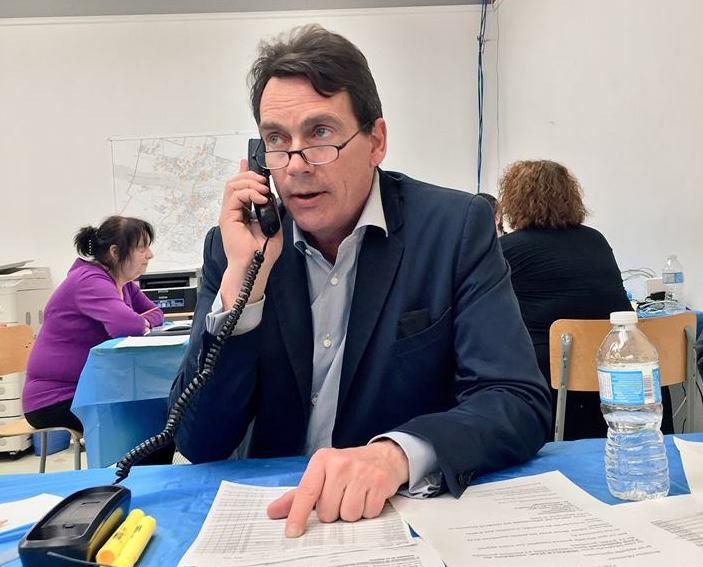 In Saint-Jérome, former Quebecor CEO, Pierre Karl Péladeau defeated Liberal candidate Armand Dubois — though Péladeau played a controversial role in the election campaign, he could well become the PQ’s next leader. In Laval-des-Rapides, the 22-year-old former student leader Léo Bureau-Blouin lost his bid for reelection to Liberal businessman Saul Polo. In Crémazie, PQ language minister Diance De Courcy and in Saint-François, PQ health minister Réjean Hébert lost. The CAQ had a much better night than it could have expected. It will improve on its current 19-seat caucus by a handful of seats. There’s no doubt that the PQ campaign now seems like an incredible miscalculation, and Marois will almost certainly step down as the PQ’s leader. But how did Marois and the PQ fall so far? Here are four reasons that show how tonight’s result came about. Headlines throughout Québec’s raucous election campaign have highlighted emotionally charged issues, such as a new charter on secularism, a potential referendum on independence and new regulations promoting the use of French. Nonetheless, surveys show that voters routinely list health care as the top issue facing the province’s next government. With three former health ministers leading the three top parties in the province, including Liberal leader Philippe Couillard, a former neurosurgeon, there’s no election better placed for examining how to improve Québec’s health care options. The provincial government’s role in the health care system began in 1961, when it signed up to the federal Canadian single-payer health care system and began reimbursing hospitals for medical services. 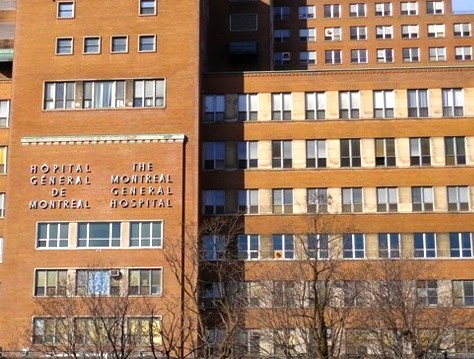 A decade later, in 1971, Québec first agreed to reimburse services for non-hospital costs, and the provincial government began opening its own health clinics. Today, health care costs consume 51.8% of the province’s budget, excluding debt service. Governments of the past decade from both major parties have routinely increased health spending, even while attempting to rein in spending for other areas. RELATED: Will bilingualism doom the Liberals in Québec? Will bilingualism doom the Liberals in Québec? One month ago, on the popularity of premier Pauline Marois’s push to enact a ‘secular charter of values’ (la charte de la laïcité) that would ban the wearing of religious symbols, including the Muslim hijab, it seemed like the sovereigntist Parti québécois (PQ) was headed for a huge victory on the basis of ‘cultural’ values that, for once, had little to do with Québec independence or with the status of the French language in the province. Two weeks ago, that conventional wisdom was upended, as the PQ’s star candidate Pierre Karl Péladeau and Marois spent days speculating about a potential independence referendum and how Québec might separate from Canada and still retain the Canadian dollar and open borders with the rest of Canada. The sudden return of the independence debate to the campaign agenda seemed to scare many votes into the arms of Philippe Couillard, the new leader of the Parti libéral du Québec (Liberal Party, or PLQ), which has been out of power for barely 18 months after nearly a decade in power. Now, after the final debate among the four main party leaders last week, Couillard’s comments in defense of bilingualism have shifted the debate once again to yet another controversial issue — the proper role of the provincial government in promoting French and/or English within Québec. Last Thursday night’s debate was vastly different from the previous debate. 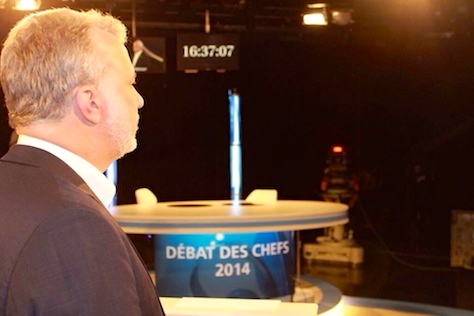 Whereas Marois took much of the heat in the first debate, Couillard received more criticism in the much feistier final debate — likely because polls increasingly show that the Liberals have not only recaptured the lead from the PQ, but that it could win a majority government. To American ears — or, possibly, to Ontarian or British Columbian or Albertan ears — that shouldn’t be controversial. But in many regards, the French language debate is even more fraught than the referendum debate, because it’s not as hypothetical as an independent Québec. The province’s 8 million citizens comprise a tiny island of French speakers within a sea of 341 million (mostly) English speakers in the United States and Canada. 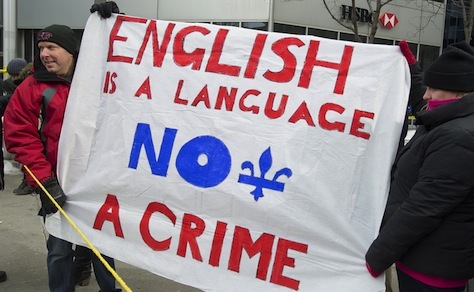 Without the Québec government’s interest in protecting the French language, English might easily overrun French as the language of Québec commerce and industry, putting the province’s native French speakers at a disadvantage in North America’s French-speaking heartland.